Teachers are growing fonder of technology every year. Even the dreaded mobile phone is gaining acceptance as a classroom tool, at least among those who participated in THE Journal's third-annual Teaching with Technology Survey. 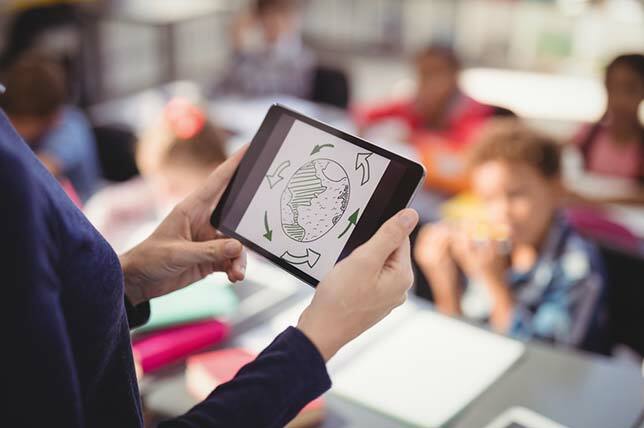 While teachers in each of the preceding survey were, for the most part, pumped up about tech for learning, this year's results reveal an evolving positivism not just about tech, but about the direction tech is heading. Roughly the same number were positive about tech's impact on the difficulty of teaching. About 77 percent said tech has made their jobs easier (44.48 percent) or much easier (32.27 percent). About 15 percent said it's made their job harder, and 2 percent said it's made their job much harder. The rest were neutral. There was overwhelming agreement, as well, that tech has had a positive impact on the effectiveness of teaching. Eighty-seven percent of respondents said tech has positively impacted their ability to teach. Ten percent said it's had no effect. Three percent said it's had a negative effect. Responses about tech's impact on student learning were similar, with 84 percent saying it's had a positive impact, 6 percent saying it's had a negative impact and 10 percent being neutral. When asked whether they "believe technology will have a positive role to play in education in the future," respondents were nearly unanimous: 96 percent said "yes." An overwhelming majority favored schools providing devices to students (81 percent), but it was just a large majority that favored students bringing their own devices to schools for classroom learning (47 percent). About a third were against students bringing devices for classroom learning; the rest were neutral. Nearly half of respondents said students in at least some grades in their schools had 1-to-1 devices. Just 14 percent require students to bring their own devices (BYOD). The most common devices used in classrooms this year were laptops, cited by 37 percent of respondents. That was followed by Chromebooks at about 14 percent and mobile phones also at about 14 percent. Paper/pencil came in fourth at 12.5 percent, followed by tablets (10 percent) and desktop PCs (9 percent). 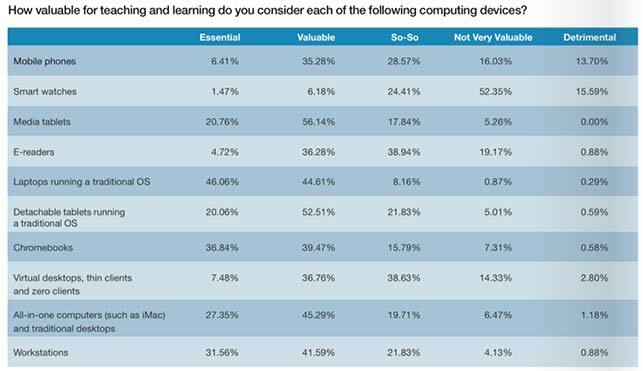 Among teachers, though, the most popular devices were laptops running traditional operating systems (Windows, macOS, Linux), with about 91 percent saying those devices are either essential (46 percent) or valuable (44 percent) for teaching and learning. Media tablets (iPads and Amazon devices) barely edged out Chromebooks for a surprising second place finish, with 77 percent positive. Chromebooks were at 76 percent positive. High-end workstations, all-in-one computers and detachable tablets running traditional operating systems all came in around 72 percent positive. For the first year of this survey, smartphones had more positive ratings than negative. About 6.5 percent said mobile phones are essential to teaching and learning, with 35 percent saying they're valuable. A bare majority (52.5 percent) said they allow the use of smartphones in the classroom. Meanwhile, 16 percent of respondents said phones are not very valuable, and nearly 14 percent said they're detrimental to teaching and learning, and 20 percent reported that their institutions ban students from bringing phones on campus. Confiscation is the penalty for using cell phones in the classroom among 60 percent of respondents, followed by suspension (5 percent), expulsion (1 percent) and referral to law enforcement (1 percent). The remainder reported no penalty or no significant penalty. The highest "detrimental" rating this year, however, went to smart watches, at nearly 16 percent. Smart watches' positive ratings were in the single digits. This year's survey also asked teachers about specific technologies used in their schools, including makerspaces and electronic textbooks. Almost two-thirds (63 percent) said their schools use a mix of electronic and paper textbooks. Just 11 percent are fully digital at this point. Open educational resources are in use by 80 percent of respondents to the survey as part of classroom instruction. Makerspaces are in 35 percent of schools represented by this year's survey participants. In those schools that have one, the makerspace is located in the library/media center (53 percent), in classrooms (49 percent) and in a dedicated facility (18 percent). Technologies associated with makerspaces are also becoming more common, with educators reporting that their teaching environments include 3D printers (31 percent), robotics systems (28 percent), die cutters (28 percent), scientific sensors and probes (27 percent), and 3D scanners (8 percent). Most teachers said they receive adequate training and support for the tech they use (61 percent). However, that support doesn't necessarily come via official channels. Most teachers said that when they run into technical trouble, they solve their own problems either by searching online for help (40 percent), turning to peers for help (15.4 percent), asking students for help (3 percent) or going to user forums (3 percent). Just 22 percent turn to the help desk or IT department firs for help, and just 10 percent go to an instructional technologist. Two-thirds of teachers spend more than half their instructional time using technology. More than two-thirds of respondents teach either exclusively blended classes (36 percent) or some blended classes (31 percent). Only a third said they flip their classrooms. And overall, teachers are confident in their ability with tech. About 20 percent said they're absolutely confident in their tech capabilities, and 67 percent said they're very confident. Another 11 percent rated their skills as adequate. Less than 2 percent said they're overwhelmed by tech and that their skills are below average. Teachers are less confident in their students' ability with technology. Five percent rated their students as excellent with tech; 37 percent gave them an above average rating; 47 percent said their students are average. Eleven percent put their students below average or failing. Meanwhile, 57 percent assign homework that requires the use of technology, though only 10 percent of respondents said their schools provide internet access for students who lack access at home. Only 6 percent said they believe that all of their students have internet access. For their own training, teachers seem to prefer a mix of electronic and face-to-face professional development (PD) (81 percent), with 14 percent preferring PD to be delivered electronically.